THE NATURAL HAVEN: Henna or Conventional Hair Dye? Henna or Conventional Hair Dye? Jess asks , 'I was thinking of getting a color. I have always used a rinse never a permanent color but I find the rinse dose take as well on my natural hair than it did on my relaxed. Do you think henna vs. popular dyes is safer. I always thought henna was a natural color.' This is a great question. Let me start by saying natural does not mean safer. Henna has been reported to cause mutations to some human cells and there are disputed reports on whether permanent hair colour could possibly cause cancer (SCCP report and European Journal of Cancer, pg 1448-1454, 2006). The issue of safety is always relative, therefore I would ask you to do your own independent research and decide for yourself if the risks are worth it in your own opinion. However, the case of the difference between conventional hair dye and henna is definitely one I can answer (See image below too!) 1. Temporary hair colour (often rinses, mouses etc) This is typically in a gel, rinse or mouse form. The dye is made up large particles which do not penetrate through the cuticle (however if hair is chemically treated -bleached/relaxed then the dye may to some extent travel further within the cuticle). The dye will wash off quickly. (Clinics in Dermatology, pg 431-436, 2001). 2. Semi-permanent hair colour This dye will last 4-6 weeks. The dye will allow for a darkening effect usually within 3 tones of the original colour (Dermatol Clin, pg 19–27, 1991). Grey hair can easily be covered. The hair dye particles in this case are smaller than those of the temporary dye and can travel slightly in and out of the cortex as well as attaching to the cuticle. 3. Permanent hair colour This dye is usually a two step reaction with an initial application of a chemical to raise the hair cuticle such as ammonia. After this the dye can enter the cortex and undergoes a chemical reaction (usually oxidation) which allows the colour to develop and also has the additional effect of tying the molecule to the cortex. This colour does not come off and can lead to hair damage due to the raising of the cuticle. 4. Hair bleach Bleaching is needed to get dark hair to a much lighter colour. The process usually involves applying a solution of hydrogen peroxide to the hair. This has the effect of dispersing and dissolving the pigment (melanin) that gives hair its colour. This process affects the hair cuticle and can cause fragility to the hair strand. 5. Henna Henna is thought to deposit on the cuticle. 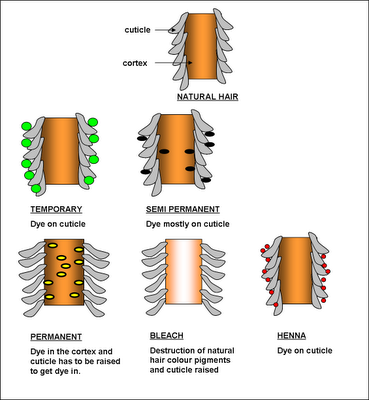 Its 'permanence' comes from the dye being strong attracted to hair protein (keratin). Read more here Information for this post also from the following books 1. Hair and hair care by Dale H Johnson 2. The science of hair care by By Claude Bouillon, John Wilkinson Remember that hairdressers have tips and tricks to change hair colour by combining some of these methods together. The use of intensive conditioning is necessary with any colouring process to avoid problems (dryness, breakage, static) associated with the particles binding to the hair and cuticle damage.